New from the If this student affairs gig doesn’t work out files. Passed this building on Highway 71 somewhere south of Kansas City. Photo taken at a speed of approximately 80 mph. Leaning across the driver of the vehicle. 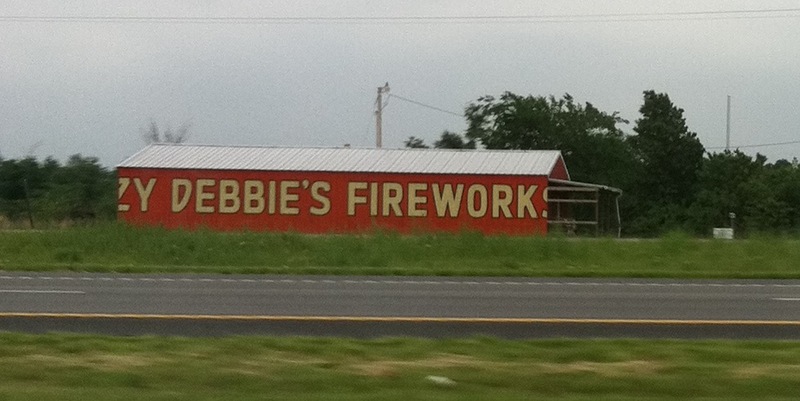 If you look closely, it appears the original name of this pyrotechnic establishment was “Crazy Debbie’s Fireworks”. What the photo does not show you is that the north end of building has been blown out and a semi-trailer near the building was toppled over with apparent fire damage. This entry was posted in perseverance, Photo, student affairs. Bookmark the permalink.